We know that Millennials love bus travel. There are over 80 million Millennials, and many seek adventure without a pre-planned travel structure. A bus trip is the perfect transportation to those desired destinations. 1) Flexibility – A bus tour can be custom tailored in so many ways. Time, day, direction, route, and side trips. Out of the way, off the beaten path, more low key places of interest can be scheduled into the itinerary. It doesn’t have to be ‘touristy’ one bit. 2) Companionship – Millennials have expressed the desire to have friends as traveling companions. A bus tour is best for that. You are together for the entire time, talking, engaging, watching the scenery together, and exploring your destinations. It is a great bonding experience that will surely become a fond memory to look back on from the future. 3) Connectivity – You don’t have to disconnect from the world wide web. While traveling, you can post continually on social media, live stream, take tons of images or videos, and research and read about the places you are headed to. Millennials are highly skilled at finding and embracing all the subtle granular nuances of the trip – the little vintage clothes shop, a state’s best ice cream, the natural food café, the little town that was perhaps a set for a cool TV show. 4) Entertain Yourself Along the Way – A bus tour is a great time to catch up on viewing a new streamed season of a favorite Netflix show, or spend time listening to a recommended playlist on your Apple Music or Spotify, get in touch with a friend who lives near one of your destinations, create perfection with one of your photo or video apps, or, even power down and relax as the country’s scenery floats by the window. 5) It’s Relatively Inexpensive – There is a lot of bang for your buck, which means there will be more left over for exploring once you arrive. 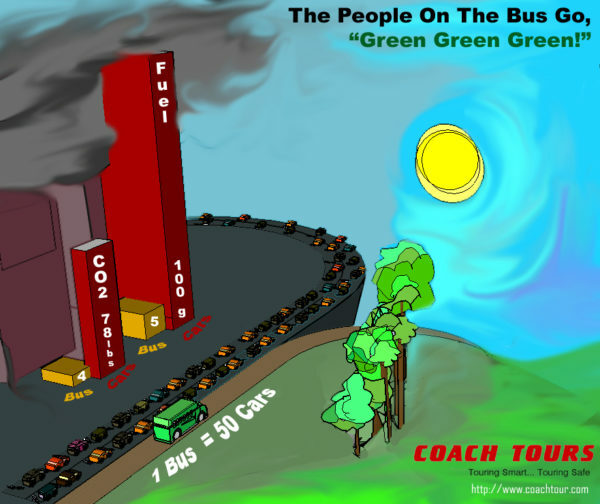 6) Bus Travel Is Green – Millennials probably know that one bus equals 50 cars! 50 cars will use 100 gallons of fuel for every 5 gallons that one bus uses. So, all your friends can board the charter bus and leave their cars parked back at home, knowing that you are doing a little bit to help out the planet! 7) Comfort – OK, you’re not like grandma or your elderly uncle, you don’t mind a little bounce or cramped space – but, once in a while, it is certainly so nice to kick back in a luxurious seat in a climate controlled environment while a professional, courteous, experienced driver gets you to where you want to go! 8) Board Quickly – Yay, you don’t have to arrive over 2 hours before departure! There won’t be airport traffic backed up along all the access roads, and if someone drops you off, they won’t have just 10 seconds to pull to the curb so you jump out of the car. 9) Liquid Stuff is OK – That 32 ounce bottle of designer spring water, or that Starbucks Iced Lightly Sweet Chai Latte can board withyou! So can that large container of shampoo that you didn’t have time to carefully funnel into a tiny plastic travel bottle. 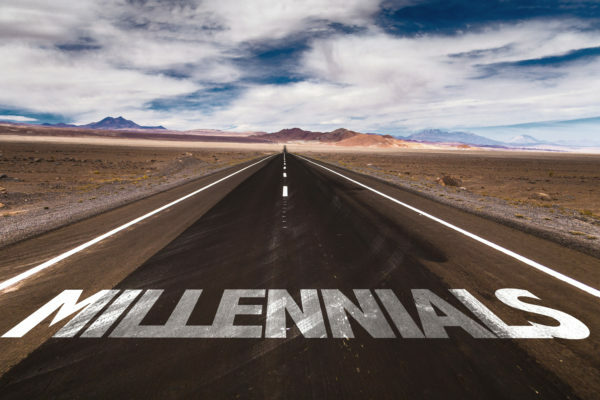 10) Millennials Love Buses – DePaul University did a study and found out that millennials account for almost 75% of city to city bus travel. They tend to drive less. Cars may not be viewed as a means to freedom – they are often considered just the opposite. Bikes, walks, and other transportation means are generally desired. Buses have that charm, that tire-to-ground connection to the travel route, that climb up a few steps to enter a little world of pending adventure! As always, we will tell you that our customers come above everything else. Our safety records are at the top of the tour bus industry, and everyone from our phone representatives to our mechanics to our drivers are there for one thing – to ensure that your travel on Coach Tours is the absolute best it can possibly be. Get your short excursion or longer journey in motion today – by just giving us a call – of quickly filling out the ‘Get a FREE QUOTE’ form that’s right on this page – to share your desired itinerary. There are always recommendations or additional options that we can add into the mix to make your charter bus experience perfect for you and your traveling companions.